Run for the Greyhounds! 5k and 10k options. BRGA has partnered with Bishop’s Events, a group that provides area runners with high quality races that benefit local charities. For two sippin’ series races this Fall, Bishop’s will be giving 25% of profits back to BRGA. Walkers, leashed dogs, and strollers are welcome to participate. Dingo needs a home - he is a sweet brindle boy who suffers from seizures. If you fit the special criteria and can open your home to a wonderful grey that needs medication, apply today! Dingo, a broken leg dog, has come to Virginia to find his forever home. Help offset the costs of his remaining care by donating to BRGA. Oscar is our first hound in need for 2018. He ruptured his tendon and required $3,600 in surgery and recovery. Interested in Joining the BRGA Board of Directors? WE WANT YOU! Blue Ridge Greyhound Adoption has open positions on its Board of Directors. If you are interested in self-nominating for a position on our Board, please send an email to info@brga.org stating your intent to run for a position, confirmation that you will adhere to the by-laws of the organization, and a brief biography that describes the skills and abilities you will bring to the position NO LATER THAN January 25, 2019. You must be a member in good-standing to run for a position on the Board. Elections will occur during our annual meeting on February 17, 2019. Required attendance: monthly meetings (alternating web and in-person) to discuss adoption days, fundraising for medical costs, meet and greets, and fun events for BRGA members. Not able to commit to the board? We need occasional volunteers too! 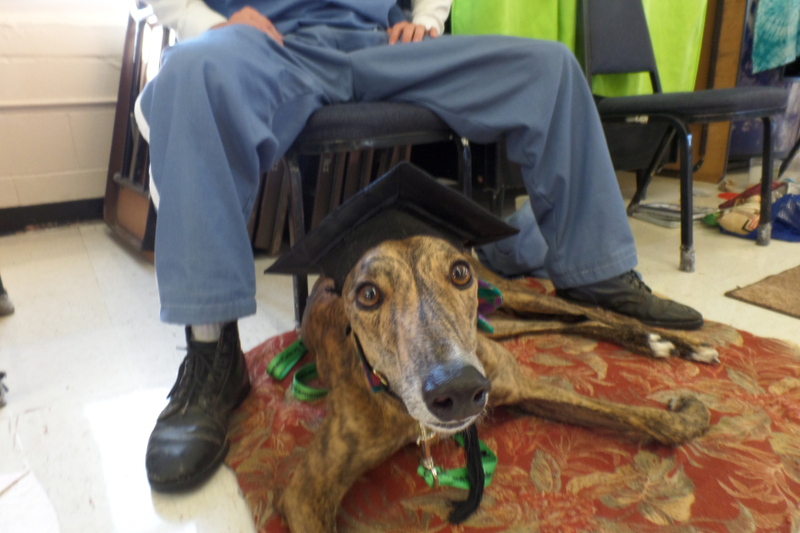 Blue Ridge Greyhound Adoption (BRGA) follows strict bylaws in order to maintain our 501 (c)(3) status. In keeping with the changes coming over the next few years, the BRGA Board Members have reviewed, revised, and edited the bylaws that have been in place since 2005. Updating BRGA bylaws will help us stay current and allow BRGA to move forward as a group. The modifications will streamline our processes and time frames for accomplishments as well as further define roles of each of the Executive Board Members. Please review and comment. The new By-Laws will be voted on at the Annual General Meeting on February 17. We hope members can attend and take part in the discussion and vote. This year BRGA will be selling 2019 wall calendars and Christmas cards. All proceeds benefit finding homes for retired racers. Check out our store to pre-order calendars (to ship mid December) and get adorable Christmas cards (quantities limited). 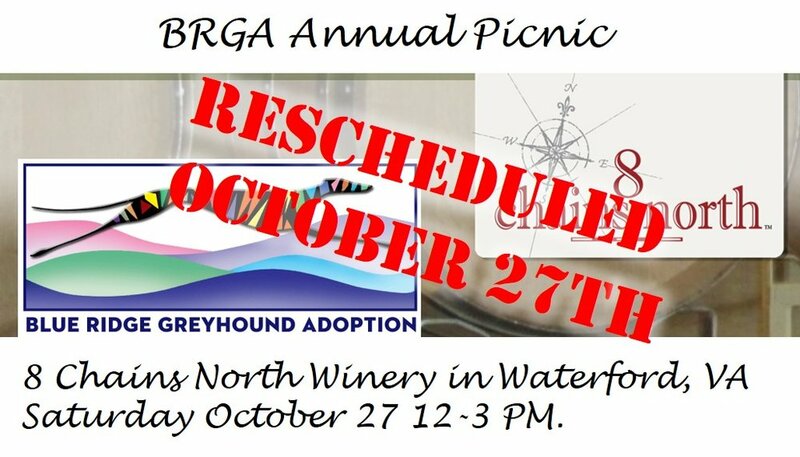 Attention BRGA members who are attending our picnic this Saturday, October 27. Please note that the weather has once again put a damper on our plans. We will still hold our picnic at 8 Chains Winery but due to the forecasted cold weather and rain, we are forced to move indoors to a private room on the second floor of the building. For those attending with dogs, please bring a blanket or bed for your dog’s comfort. Everyone will still have access to the dog run outside as needed. All activities – lunch, auction, blessing of the hounds, ice cream social, etc. – will still take place. We look forward to seeing you on Saturday. As a reminder, the address is 38593 Daymont Ln, Waterford, VA 20197 and the time is noon to 3pm. See you there! Thanks to all who donated to Patches for his recovery. We can report he is healing well and will be ready for a home shortly. We hope we will be able to bring him to Virginia to find his forever home. If you're interested, please put in an application now! Meet Patches! He is a beautiful blue-fawn male. He broke his leg and is recovering from surgery. BRGA is looking to raise funds for his recovery $2,000. Once recovered, he is hoping to make the trip up to Virginia to find his forever home! Thank you for supporting Dingo! 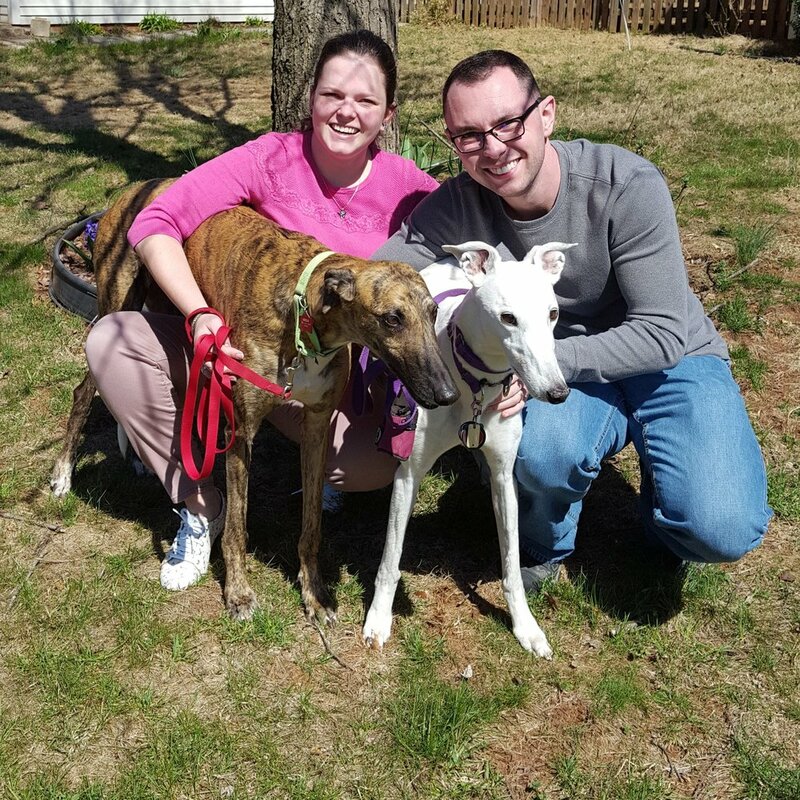 BRGA's Special Needs Greyhound, Dingo, has a Forever home!! Thank you to all who donated and promoted Dingo! 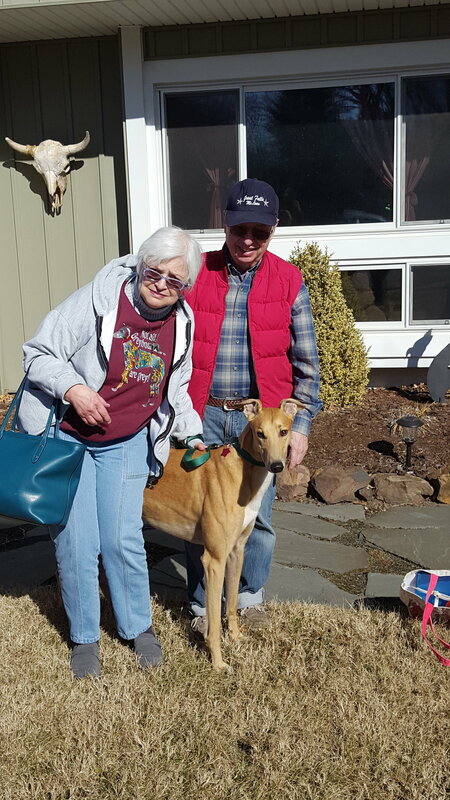 Dingo's story has a happy ending and BRGA wants to thank all of you who have donated to help this fabulous Greyhound! Dingo's start in retirement was fairly rough with the discovery of his epilepsy on top of his already healing broken leg. This resulted in several days of an ER visit and multiple trips to the veterinarian, medications, supplements, and special food. BRGA's cost ran over $2000 for Dingo's care. While in recovery of his epilepsy, BRGA found out he had an auto immune eye disease. This meant more trips to the vet, new medicine and management of that eye. BRGA could not have done any of this without all of you who donated and participated in our special auction for Dingo. We'd like to thank you and let you know that your donations matter!! 100% of your money goes to help these Greyhounds in any way possible to secure them into a forever home. BRGA would also like to give a special Thank You to our foster family, Dianna, her husband, Karl, and their daughter for taking such good care of Dingo with all of his special needs and making him a member of their home until a new one could be found. We are forever grateful for what you all have done on behalf of BRGA. Congrats to Oscar who found his forever home this month! It's because of generous donations from BRGA members that we were able to sponsor his surgery and aftercare and bring him up to Virginia to enjoy retirement.